Drake's Statue is situated on Plymouth Hoe, overlooking Plymouth Sound. The National Grid Reference is SX 477 539. Drake's Statue on Plymouth Hoe. When it was decided to erect a national monument to Sir Francis Drake there was a poor response in terms of hard cash. The first list of subscribers was published on Thursday June 23rd 1881 and showed that only £513 12s had been received by the Honorary Treasurer, Mr William Derry. The largest donations, of £50 each, had been given by Sir Francis Drake (not the original one, of course, but a later relative) and Mr Derry himself. The Mayor of Plymouth, Mr F A Morrish, gave £25, as did the Reverend T A Bewes and Mr Burnard. While arguments raged about what to do, the Duke of Bedford paid for the statue to be erected at Tavistock. It was designed by Sir Joseph Boehm RA and the Duke later gave him permission to make a replica for a much reduced sum. 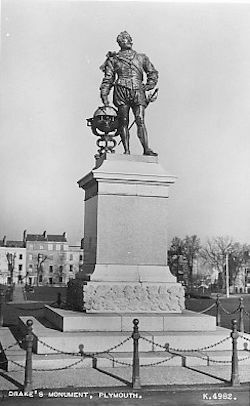 It was this 10 feet high bronze replica that was placed on Plymouth Hoe and it was unveiled by Lady Fuller Drake of Nutwell Court, Honiton, on February 14th 1884. A chair made from the timbers of Drake's ship the "Golden Hind" was used at the ceremony. Lady Drake was the wife of Sir Francis Fuller Drake, a representative of the female line of Drake's brother, Thomas. The statue was cast and erected under the supervision of Mr Moore of the Thames Ditton Foundry. The pedestal of Aberdeen granite was designed by Messrs Hine and Odger, of Lockyer Street, Plymouth, and was erected by Mr Samuel Roach, also of Plymouth. Students from the Royal Naval Engineering College had time off between 10.30am and 2.30pm to be present at the unveiling ceremony. There were about 6,000 people present, with several bands, guards of honour naval reserve, highlanders and marines, 2,000 school children, the fire brigade and three fire engines. A salute was fired from 17 guns on the Hoe, the noise and smoke being blown on to the crowd. At the time of the 400th Anniversary of Drake's circumnavigation of the globe the Lord Mayor of Plymouth, Mr Ramsey Thornton, received from the Sir Francis Drake Commission of California a plaque commemorating Drake's landing somewhere in Marin County, California, in June 1579. Ten members of the Commission and their families arrived in Plymouth on Tuesday August 2nd 1977 and presented the plaque to the Lord Mayor at a special banquet. of Magellan and discovered Drake Passage south of Cape Horn. presence of Queen Elizabeth on April 4, 1581.
the Quadricentennial of Drake's voyage around the world.